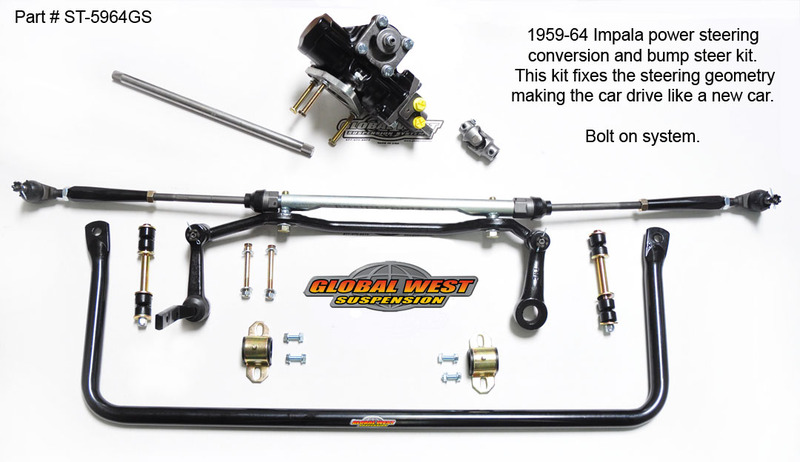 If you are looking for a kit to fix the steering problems for 1959, 1960, 1961, 1962, 1963, 1964 Impala, El Camino, Biscayne, and 58 if you want to do a spindle and steering knuckle change we have it. Bump steer is a problem with these older cars and the majority of the problem is the factory steering system. If you are looking at this kit you know you have a steering problem. Wander and depending on how big your tire and wheel package is will determine how bad it is. The condition is not because it is a old car, it is because the bump steer has been off from the factory. they always drove like that and with the new tires it just got worse. So you may ask What is bump steer? Bump steer is when the suspension moves up and down and one or both wheels point on their own a different direction without you turning the steering wheel. This is caused by incorrect angles between the suspension control arms and the steering linkage. Watch the videos below and you can see the change in the toe settings. The toe is the direction the tires are pointing. If the tire points other than straight when the suspension moves up or down without you turning the steering wheel, the car will have a tendency to wander over bumps and during body roll. Many people believe it is just the way old cars drive, but the condition can be fixed with this simple bolt on kit. This kit comes complete with the suspension components needed to solve this issue. The steering box (Borgeson) is an integral 14:1 so you will only need two power steering hoses, pressure and return, not four. Note: Other power steering boxes will not work with this kit. The factory power ram is no longer required. This also means the pivot assemble on the factory center link at the pitman arm will no longer apply. The spring loaded pivot ball assemble at this location is no longer required. Our conversion kit eliminates the spring loaded ball and converts it over to a newer style center link that is more like a ball joint. When installing the Borgeson box clearance to the radiator will be your main concern. If you run into this problem there are aftermarket radiators that are built to fit the larger steering boxes. Here at Global West we are working on supplying radiators for various applications. This steering box will also have a mounting plate attached to the box. The plate will set the correct angle for the steering geometry. One advantage using this steering box is with the new linkage, we are able to have the box centered internally. This combination means left and right turns have the same turning radius. The center link as seen in the photo has a relocation bar attached to it that sets up the correct steering geometry for the system. Note: The factory center link if used will never have the correct bump. We ship the assembly complete ready to install. As for the factory sway bar, it will no longer work. You must use a sway bar that attaches to the frame before the steering box (closer to the radiator). Our sway bar SB-5864G is designed to do just that and is supplied in this particular kit. Spindles: The stock spindle for a 59-64 Impala or a dropped spindle will work provided the steering knuckle arm is in the same location as stock. We have 2 inch drop spindles for 58-64 Impala that except a Wilwood brake system. We can install up to a 14 inch disc brake. 1958 Impala - uses a different spindle and steering knuckle arm, for proper bump steer our kit requires you to use a 59-64 steering knuckle and spindle on your 58. The combination will bolt up with no trouble. The steering system basically bolts in except for relocating the sway bar and possibly drilling a 3/8 hole for the idler arm. This kit is pretty much straight forward. Once you have installed the system you will require an alignment. 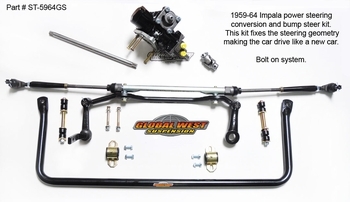 See Global West tech videos that show what bump steer is doing using the factory steering linkage and what it does after the new kit is installed.